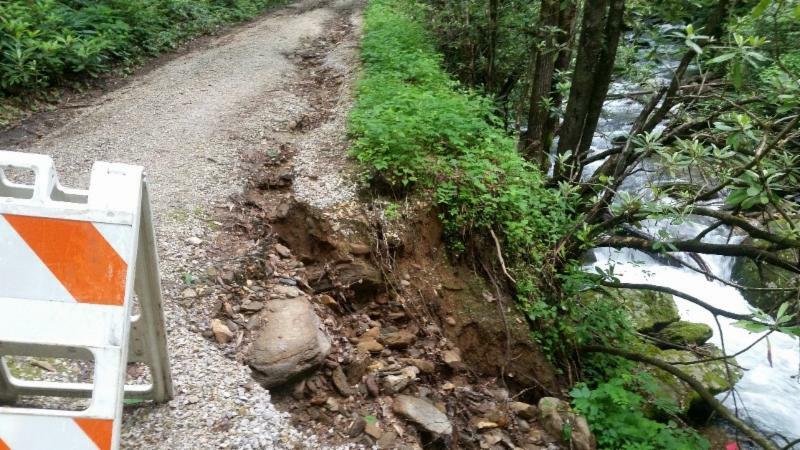 Windy conditions combined with weeks of prolonged heavy rainfall has increased hazards on the Nantahala and Pisgah National Forests. Heavy rainfall has damaged roads and assessments are ongoing. Trees on saturated soils have an increased chance of falling. High winds make falling trees even more likely. Saturated soils can also cause mudslides. Additionally, rivers and streams in the national forests are high and flowing rapidly creating hazardous conditions. Visitors should use extra caution when recreating on the forest this week. Contact your local District Office to get the latest information on road conditions. Many places in the Forest do not have cell phone service so know before you go. Ranger District contact information may be found at the National Forests in North Carolina website www.fs.usda.gov/main/nfsnc/about-forest/districts. Avoid traveling alone. If you must travel alone, share your plans. Tell someone where you are going and when you expect to return. Barriers placed at closed roads are there for your safety. Don’t move barriers – other drivers may not realize the danger. Don’t drive around barriers in the mistaken belief that your vehicle can handle any situation. When canoeing or kayaking, know your limits; do not attempt to navigate a section of river beyond your skill level. Never climb on or around waterfalls and never play in a stream above a waterfall. Rocks can be slippery and it’s easy to lose your balance especially with bare feet. Currents near waterfalls can be extremely swift even in areas further upstream.